An attention-getter and trend-setter, the zinnia flower has a reputation for creating quite a stir wherever it goes. So what better focal point for a wreath that welcomes all to your home or another’s with an abundance of warmth, liveliness, and cheer. The twig base is laden with several lush layers of naturally preserved components, including Celosia, Yarrow, Statice, and Hydrangea. 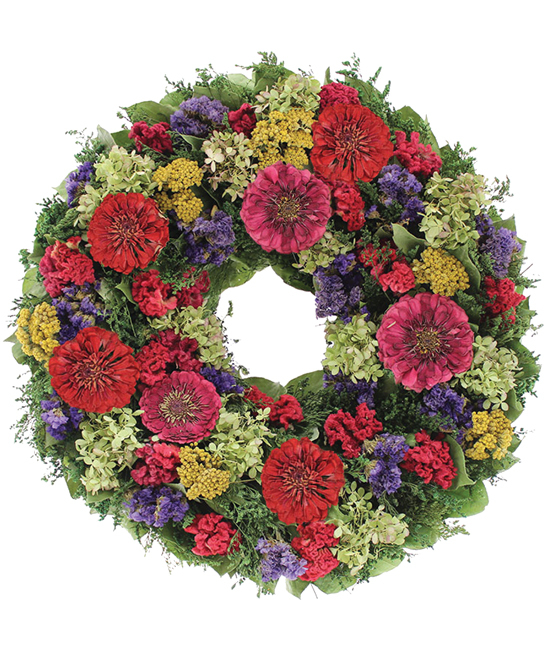 Finishing the wreath off in fine fashion are the zinnias we love so much, shades of red and pink complementing everything else in a dynamic display of seasonal elegance.